"Your birthday is a special time to celebrate the gift of 'you' to the world"
This technique is a lovely way to display a special greeting for a special someone on their special day. 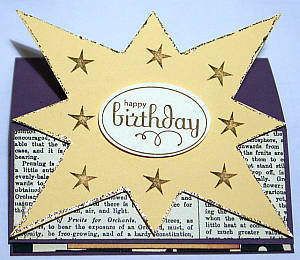 Here I have cut a star out and decorated it with glitter and stamps to form the front of my greeting. I drew the star freehand (well, with the help of a ruler - lol!) on Barely Banana cardstock (it is retired now so you could use Daffodil Delight or So Saffron instead) and stamped it up in Soft Suede ink with a sentiment from Stampin' Up! 's Perfect Punches stamp set (NLA), before punching it out with the Large Oval paper punch. I think the star images are from Stampin' Up! 's Seasons of Joy stamp set (NLA). The star shape here is just one idea. Make a greeting your own way. Scroll down to read more about what I mean. I used designer paper from the retired Stampin' Up! Newsprint range to accent the star and sponged it with Soft Suede ink. Then I adhered it all to a card blank folded to be an easel card made from Elegant Eggplant cardstock. 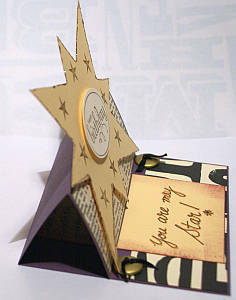 I used Stampin' Dimensionals to pop up both the main star and the sentiment. Inside I made a greeting out of more Barely Banana cardstock and wrote a message out in my own handwriting before sponging it with Soft Suede ink. I adhered it with Stampin' Dimensionals to a layer of Newsprint designer paper too and added some gold buttons with black ribbon tied through them to form the props for the front when the greeting was opened. And it was done! A quick and easy project! You could make your own shape for the front of your greeting of course. Just make it from a piece of cardstock that would normally be about the size of the front of your creation. That way it will fit into your envelope. If it doesn't matter that the greeting fits inside an envelope (say you were going to hand deliver it or it was for someone from your family, who you live with) then all you would have to worry about is that the size of the shape did not overbalance your project. Experiment with a few sizes and shapes and see what works best for your own purpose. Remember you can also make your own envelopes to fit the size of your project. 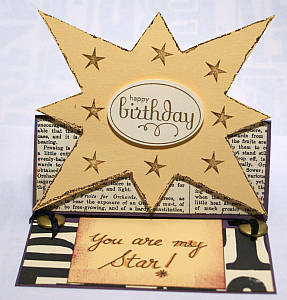 What can you make for a birthday easel card using current Stampin' Up! products? How about a robot easel, or a cut out flower shape, or lego blocks, or hearts, or butterflies? You can make this technique work by using so many different images!